movingworld GmbH. Image from iTunes. Those of us who enjoy outdoor activities such as hiking, skiing, fly-fishing, mountain biking, and more, tend to be "map-centric" in the way we plan trips and navigate when we are outdoors. That means that most of the GPS navigation apps on the market aren't a perfect fit, because they tend to take a flat, point-A-to-point-B approach, and they don't work well (or don't work at all) when out of range of mobile cellular signals. 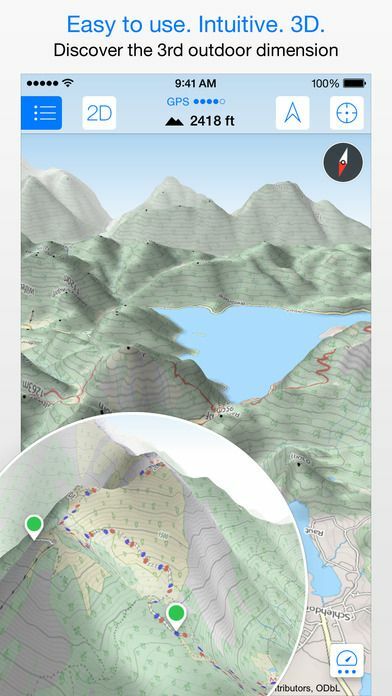 The Maps 3D Pro app, however, is map-centric, and it allows free map downloads and storage to your device for off-line access, making it refreshingly different among outdoor recreation apps. Maps 3D Pro has an easy-to-use search feature, and rich, 2D and 3D color topo map views that let you quickly find and view the lay of the land at your chosen destination. In use, we found the maps to be quite detailed and accurate. The app's maker states that it compiles maps information from NASA scans of the earth's surface, plus Open Street Map, plus official USGS topo maps and aerial photography. The app features 11 map types, including three types of topographic maps, hiking maps showing hiking trails, classic and MapQuest Open Street Maps, MapQuest satellite view, USGS topo, OpenSeaMap including port details, ski trail maps, and commuter transport. Rather than limiting its scope to select areas, such as North America, then charging for additional map access, Maps 3D Pro includes global map coverage and free offline map storage on your device. The maps database also includes complete trail maps for more than 340 ski resorts worldwide. When you have located your trip destination, you have a number of options. You may plan a route by selecting a start point, then simply tapping waypoints as you swipe-to-move the map in 3D or 2D views. As you create the route, details such as distance in miles or kilometers, and elevation change are tracked on the screen. When you are finished, simply save the route, and it will appear in your app's routes list. Routes are saved in the .gpx format, which is exportable to other GPS devices. Panning the map with your fingertip shows elevations directly underneath a center-screen crosshair, another terrific feature for quickly evaluating terrain. If you are at your destination and moving through terrain, you may also easily create a track for your route and save it to your routes list for future use or analysis. You may also easily mark and label waypoints as you move. Maps 3D Pro includes a digital compass, which shows heading in analog ("N" "NE" etc.) as well as in degrees. The digital compass overlay, which appears conveniently at the bottom of the screen, may be called up from virtually any map screen. The overlay also includes your precise coordinates in latitude and longitude. Saving a map for offline use (out of cell tower range) is as easy as using the search feature, or panning the map, selecting the map area to download and the map type (including major ski areas globally), then downloading and storing the map. When you select a map area, you are informed about the amount of storage it will take on your device, and the number of topo map tiles included. Overall, Maps 3D Pro is the best map-centric outdoors navigation app we've used, and we recommend it highly.